This is an excerpt from Dr. Buzby’s DIY Dog Master Course: Nail Trimming Without Fear, a blog post on the Pet Safety CrusaderTM website. It has been republished with permission and for exclusive use by Grey Muzzle. The original article may be found here. First off, let’s talk a bit about canine nails. They are made of keratin just like human nails. When they get too long, they affect the toes, either pressing toes up or twisting them to the side. As Dr. Buzby explains, “Stand up and curl your toes under in your shoes. Notice how it affects your muscles and balance.” She refers to this as the “goat on a rock” syndrome. When your dog’s nails are too long, it feels like he is standing on an incline (even when he’s not), so he must bring his hind legs in, under him, to maintain his balance. This prevents him from keeping his body square to the ground like a table with legs causing his posture (the way he stands) to be out of whack as well as his gait (the way he moves). This shows that long nails are more than a cosmetic problem or something that can scratch us or the dog himself! Especially since most modern day dogs spend their lives walking on plush lawns or carpets, they don’t create enough wear on their nails, so we must step in as good pet parents and make sure nails are trimmed for health and safety’s sake! Too long nails are not only detrimental to posture and gait but may actually cause your dog’s toes to twist or curl into the pad. Long nails are more prone to catching on carpet or other material, and then breaking or cracking causing pain and bleeding and the need for pet first aid if not veterinary care. Dr. Buzby’s high performance nail trim (and I’ll tell you why it’s called that shortly), is different from what I’ll bet you or your groomer currently does. Instead of a horizontal, parallel to the ground cut, Dr. Buzby professes a series of conservative angled cuts, past 90 degrees, sculpting the nail from the top and actually removing more nail than the usually-accepted cut provides. What I like best about it is that there is less chance of hitting the quick (the blood and nerve supply situated in the lower part of the nail) than with the horizontal trim. Her lessons, which take only a few hours to get through, watching videos and studying infographics and pdfs, clearly show you the objective landmark to watch for: the pre-quick! A dense “licorice-like” material in dark nails while pinkish in the lighter colored dog claws. For dogs whose nails are just too long, you must conservatively nip only a little away until you reach the pre-quick and stop! Then again, in 5-7 days, trim away. By continually exposing the pre-quick to vibrational stimulus, it will recede (move backwards) into your dog’s nail and allow you to trim the nails shorter without causing pain or bleeding. The point is to set you and your pooch up for success by showing you the 4-1-1 you need to know to make this a pleasant procedure for you both. After all, just like humans, dogs don’t get their nails trimmed once! It’s life-long maintenance, and the reason this technique is referred to as the high performance nail trim is this…by safely taking away more nail, there is less nail for your dog to have to “break-over” with each stride. What this means is as he picks up is paw, rolling off the toes, there is less nail to break-over before he can lift the paw from the ground allowing him to make a longer, more comfortable stride. The concept is used in race horses, but applies to our canines as well. In Dr. Buzby’s do-it-yourself nail trimming course, the various modules teach you about the nails along with the best tools for the job as well as a variety of positions so that you can find which is the most comfortable for your dog and for you. Many dogs may feel most at ease lying on their side (lateral recumbency), while longer legged fellas and ladies may enjoy standing and the smaller ones — cradled in arms. For those dogs who tend to pull or jerk their paw away, Dr. Buzby suggests holding their leg in flexion, bent close to their body, which eliminates their option of pulling the leg back and injuring their joint from the repeated jerking. Others do well with you just supporting their extended leg as you sculpt away at the nail. The course contains modules on trimming black nails, light nails, large nails, small nails and even puppy nails. She even shares which set of paws are generally the easiest to do and which you should start with. Dr. Buzby demonstrates on a variety of dogs and her fun and easy-going instruction makes you feel confident that you can tackle a nail trim yourself. No matter your pets age, it makes sense to keep him healthy and safe by keeping those nails trimmed! 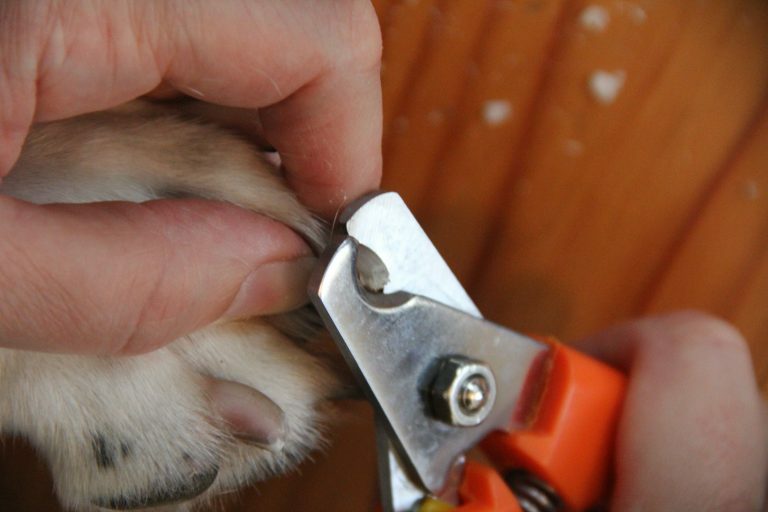 To learn more about Dr. Buzby’s Do-it-Yourself Dog Master Course: Nail Trimming Without Fear and to register, visit https://courses.drbuzby.com/. Your registration comes with a set of nail clippers (the only ones recommended by Dr. Buzby to do the job right, styptic powder (just in case) and a quick reference guide. Grey Muzzle supporters get a discount on the price - simply use coupon code GREYMUZZLE at checkout. And, $19 from every purchase will be donated to Grey Muzzle. Denise Fleck is an award-winning author, animal care instructor and radio show host who developed the curriculum for her Pet First-Aid & CPCR and Pet Disaster Preparedness Classes after training with dozens of schools and organizations, practicing, attending seminars and practicing some more. Known as The Pet Safety Crusader™, Denise has personally taught more than 15,000 humans animal life-saving skills and has appeared on Animal Planet’s Groomer Has It and Pit Boss, A&E’s Kirstie Alley’s Big Life, CBS-TV’s The Doctors, CNN Headline News, PBS-TV’s Lassie’s Pet Vet and KTLA Los Angeles as well as on radio and in magazines. She is currently the President of Grey Muzzle's Board of Directors. You can read more about her here.